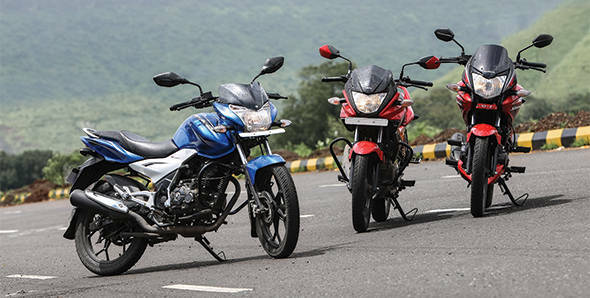 The three bikes in the test started, obviously, with the Bajaj Discover 125ST, it is all-new and OVERDRIVE's quest to keep the crown in each automotive segment current is well established. So the comparo was on. We also needed to get a sense of Hero's new 125, the Ignitor. Initially I wanted to compare these to the Honda Shine since the customers who vote with their money buy more of that Honda than any other 125cc motorcycle in the market. But we scrapped the Shine for a Stunner so you could see yourself what Hero has managed to do, or not managed to achieve, with their Ignitor which is, under its new skin, identical to Honda's more expensive 125cc motorcycle. So we ended up with essentially the three motorcycles that are either the 125cc champion at this time, or want to be. Let's get on with the test. It's obvious at the first glance that the Discover is quite a piece of work. It's radically different from its predecessor. It's a large, rounded motorcycle where the previous generation was skinny to the point of making Kate Moss look like she had love handles. This one is more fleshed out and I do like that. This also happens to solve my personal biggest ergonomics issue with the Discover - the tank used to be so ridiculously narrow that I couldn't grasp it with my knees. It also appears significantly larger than either of the other two motorcycles here, though the actual difference in length and wheelbase isn't actually that much. I believe this impression of size will be valuable in the showroom. That said, I cannot say this is a wonderful looking motorcycle. Distinctive in the segment, yes, but pretty? The lines themselves are actually quite nice but it's the heavy handed use of black plastics at the rear that ruin any impression of a lithe motorcycle for me. The hugger is impossibly large and an inch and a half later begins a fairly large splatter guard and then there is a substantial number plate hanger as well. So comprehensive is this coverage that you almost will not notice the rear monoshock and I think that is a miss. Between the other two, it's a close call. The Ignitor is based on the Stunner's lines but when you see them together you note a clear emphasis on a less sporty, more practical appearance. The screen is integrated into the fairing, for example, and the chain is housed in a full cover on the Hero. In my eyes it makes the Ignitor more true visually to its role as a commuter. But if I were a young colt out for his first or second motorcycle, I'd still pick the Stunner as the looker in the segment. But leave the looks alone and look closer. All three are extremely well-built and as we have come to expect, finish levels are very, very good on all three. I believe that in the commuter segment, the 125 is a good place to be in displacement terms for riders. They have as much as 30-40 per cent more power but retain nearly the same economy as the 100cc motorcycles. But Bajaj once again breaks the mould with the Discover, giving it 13PS, which used to be the peak power that the Pulsar 150 used to claim just a few years ago. With the other two bikes making 11.2PS and weighing a good 4kg more than the Discover, the performance end should tip in the favour of the Bajaj. But before we go into that, we have to pause to take note of the engines themselves. The Honda engine that is in the Stunner and the Ignitor is a well-known unit. It works reliably, offers great economy, is refined and quite enjoyable to punt about town. It is also old-school. Like most other motorcycles in the segment, it is a basic two-valve SOHC single cylinder engine that breathes through a carburettor (the Stunner FI gets fuel injection but is expensive). It's facetious to say a four-valve head in today's day and age is a revolution but Bajaj have, at least, moved on from the two-valve head with this Discover. The rest of the engine, two spark plugs aside, is similar to the Honda in essential configuration. But the better breathing afforded by the four valves allows the Bajaj more than just bigger power figures while matching peak torque levels of the Honda engine. As we saw in the Pulsar 200NS, the Discover engine also gains a level of refinement we have not seen on Bajaj's bikes before. It isn't necessarily a quiet engine but vibration is tightly controlled and of the three bikes here, long, high speed highway runs produced the least buzzing and the consequent numb hands. The Hondas do seem to accelerate a bit quicker at lower revs than the Discover but the Bajaj escapes their attentions very quickly indeed. Where the Hero and the Honda trump the Discover is the fuel economy. The Discover produces eminently acceptable numbers. City mileage was 57.2kmpl while highway runs produce 67kmpl - that is 59.65kmpl overall. The Stunner, on the other hand, manages 63.9kmpl in the city but roughly the same economy on the highway, for a 64.7kmpl overall figure. We were expecting the Ignitor to produce nearly identical figures and it does, more or less. 64.8kmpl in the city and 68.9kmpl on the highway. The latter boosts its overall figure to 68.9kmpl, making it the most fuel efficient motorcycle in this test, if only by a hair. It sounds stupid but the first time I rode the Discover I couldn't figure out whether it had extremely good drum brakes up front or a disc brake. Even a glance at the master cylinder didn't register, honest. What I realized after I looked at the bike properly, performance tested it and all was that the Discover doesn't lack braking power but it appears that the bite from the disc has been tuned back to offer a more friendly feel. There is more travel in the brake lever and brake force arrives as you squeeze it harder and harder but the feel is excellent for inexperienced hands - many of which are often scared of discs because they can be grabby and sharp. The Hero and the Honda are similar in brake feel to each other, and to the Discover, but with more bite and a tighter feel at the lever. Ride quality is important in this segment. Make a motorcycle that is sporty but too stiff and you will have upset customers on your hands. All three here, I'm happy to say, achieve good ride qualities. But Bajaj seem to be able to extract a level of suppleness from their suspensions that Honda isn't willing to yet. The Discover, with its telescopic forks up front and gas-charged monoshock at the rear absorbs fairly large holes in the road very smoothly. In comparison, the Ignitor and the Stunner feel stiffer, though the difference isn't that great. They are both extremely good in terms of having to live with over monsoon-broken roads but there is a softness to the Discover that takes the sting out of bad roads. That said, the Bajaj isn't wallowy in the corners either. In fact, it has a lower, wider handlebar which makes it more responsive in the corners. In comparison, the Ignitor felt a little bit taller and more accurate than the Bajaj but the Stunner feels much taller than both. This doesn't actually affect cornering ability, but makes the front wheel feel farther away which takes time to get used to. But what makes the Bajaj harder to corner are its tyres. The Stunner and the Ignitor both get very good rubber and it shows. Cornering in dicey, slippery conditions on an off-camber road - that's the true situation in the pictures on these pages - was confidently handled by both the Hero and the Honda. But there comes a point on the Disco when you simply cannot push any further. The reason is the rear tyre. It has a distinctly square profile where the front (and both the other bikes) have more rounded profiles. What that does it make edge grip meagre and when you get off you have to look close to see that what looks like a fat chicken strip is actually tread carrying on to a nearly vertical surface that blends into the sidewall. Like we said of the P200NS, but to a much larger extent, better tyres will make the Discover a much happier motorcycle to punt about. Yes, I know these aren't expected to be cornering demons in the first place but hey, if this is your first or second motorcycle, would you not corner till you finally get a bigger, more sporty motorcycle? To rank them, overall I'd say Discover and Ignitor draw, with Stunner a hair behind - Discover ride advantage matches Ignitor's handling advantage. Stunner is a little harder to get used to the feel of thanks to its taller handlebar, so third. So which is the best motorcycle here? The Stunner is the oldest motorcycle here in design terms but also the sportiest to look at and if that floats your boat, it should be the one you spend on. But the Ignitor, which is identical under the skin to the Honda is actually slightly better in our opinion by a tiny fraction. Its lower handlebar - one of the only differences between the two styling aside - does it a small favour by making the feedback from the front seem more immediate and allows you a bit more confidence in it. It happens to be roughly a thousand bucks more expensive than the Stunner though if you're really stretching your budget, the Honda saves you a small, but possibly vital, bit of your cash outlay. The Bajaj Discover has more power, better performance, slightly better engine refinement, a supple ride quality and a Rs 6,000-odd price advantage on its side. Ultimately, that is enough to overcome its poorer OEM tyres, the sporty styling made fuddy-duddy by the black plastic bits and its weird name. Sport Tourer? A 125? I'd have called it the NC125 instead. Nice Commuter.